I love how my mixed cluster stitch blanket turned out! Once I show you how to work all the loops, you are going to love making this too, I promise. Below is a video tutorial, so in case you are wanting a visual, and needing a visual, you’ve got it! 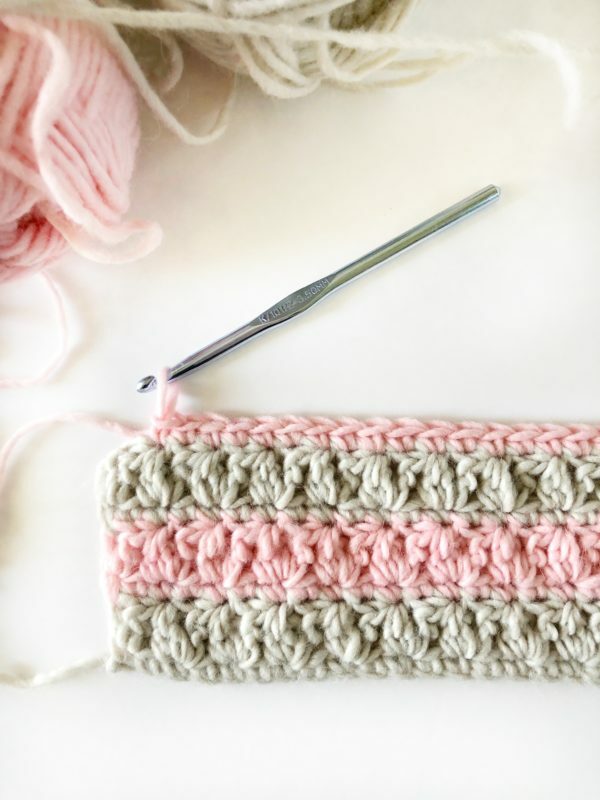 Here’s the thing about my video tutorial you must know, I am a total beginner at filming myself crochet longer than one minute. Up until now, I’ve felt pretty proud of myself filming little video clips for my Instagram stitch account and sharing, but to do a full-length video I didn’t think I’d ever figure it out. But, for my birthday, my wonderful husband searched the world wide web and found a tripod that would hold my phone at just the right angle and height for me to film. So now, I can offer you a longer tutorial. You can watch the video below or click here to watch on YouTube. As with anything, I’m hoping with more video practice I will become better at filming and editing. Which brings me to the next thing I really want to talk about with this blanket. Practice. 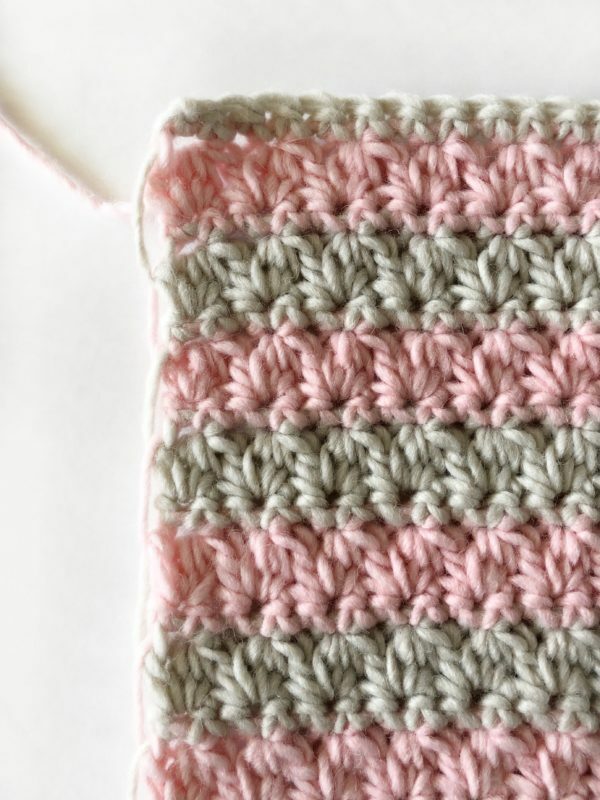 You will need to do a practice swatch, first to learn the stitch, but more importantly because of the yarn type. Paton’s Alpaca Blend yarn is what I call affordable luxury. It makes the mixed cluster stitch look amazing! It has that brushed modern look to it, instead of the twisted look of regular yarn. But with luxury comes just a bit of work. The reason you must do a practice swatch is because Alpaca Blend does not undo very easily. I would say if it has any negatives it’s that it is not a mistake friendly yarn. That means, once you work the stitches, they are sometimes hard to undo. The little fibers tend to stick to each other making it difficult to undo and start over. So, pick a yarn to practice with that you can easily undo. Learning the mixed cluster is going to take a few rows until you get used to how many loops you are making. 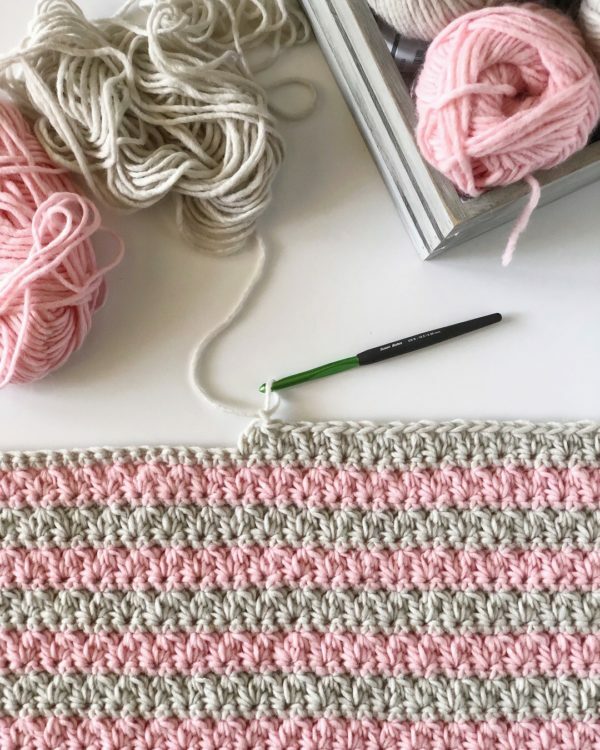 There is one last tip I want to share with you before we get to the pattern. If you haven’t seen this before, the above is a picture of what it looks like when you carry yarn up the side of the work. This means that you won’t ever be cutting yarn or weaving in a lot of ends when the project is finished. You will have few to weave in, but not ends from every color change. You will be able to easily switch colors all on one side of the blanket. (You can purchase an ad-free PDF of this pattern from Etsy. Free pattern below). Pattern Repeat: 3. (This means you may make your blanket any size you wish, just make the base chain a multiple of 3. Row 4: Repeat row 2, except pull through in the last stitch with Birch, adjust tension as needed. Row 5 – 58: repeat row 3 and 4. Tie off and weave in all ends before you start the border. Pull up a loop with Birch in any corner. Work one SC in that space. Work SC around the entire blanket keeping your stitches to about 3 per each block of color on the sides. Check your work often to prevent rippling and adding too many stitches. Work 3 SC into each corner space. When you return to the starting corner, work remaining two SC and slip stitch to join and tie off. Now stand back and admire your work! If you need to freshen the blanket, you can hand wash and then lay out to dry. Follow the yarn label for complete care instructions. I found that I didn’t need to block, or pin this blanket at all to take a great shape. I really love the results I get using this yarn. I have previously worked with Patons Alpaca Blend last fall when I made the Spider Stitch Blanket. 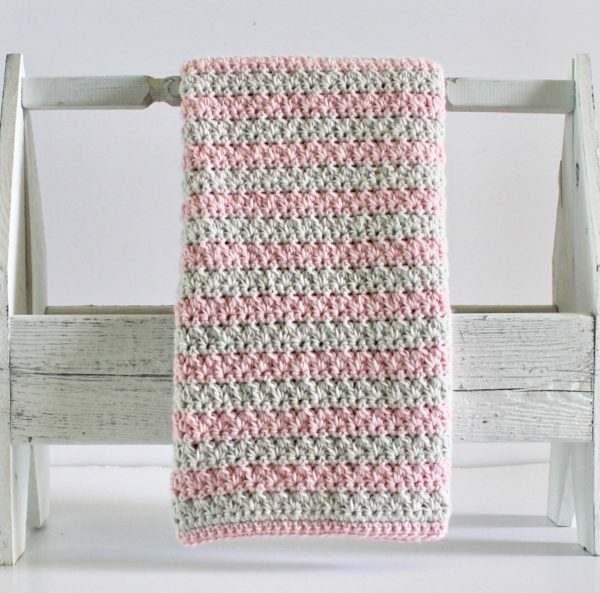 These blankets just turn out gorgeous! If you are willing to do practice swatches, I’d actually love to recommend it as a more beginner friendly yarn, simply because I think the stitches look so good. But you really couldn’t afford to make too many mistakes. So that practice swatch would be key! 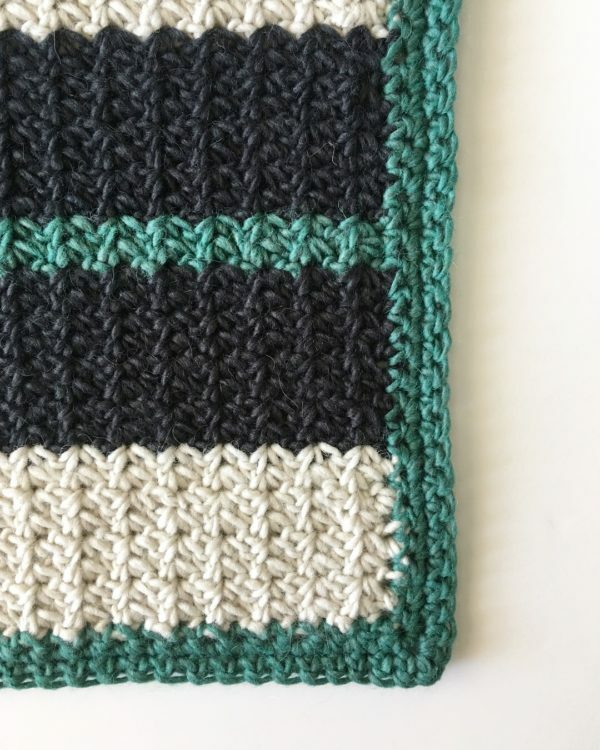 I wish you a lot of success with learning this stitch and completing your blanket! I’d love to see your finished project! Feel free to post your finished blanket to my wall on my Facebook Page or use the #daisyfarmcrafts on Instagram!